Product prices and availability are accurate as of 2019-04-23 19:00:57 UTC and are subject to change. Any price and availability information displayed on http://www.amazon.com/ at the time of purchase will apply to the purchase of this product. 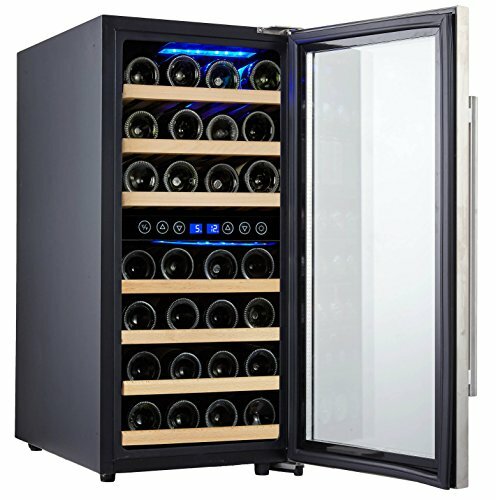 It's time to make different temperature room to store your red and white wines. 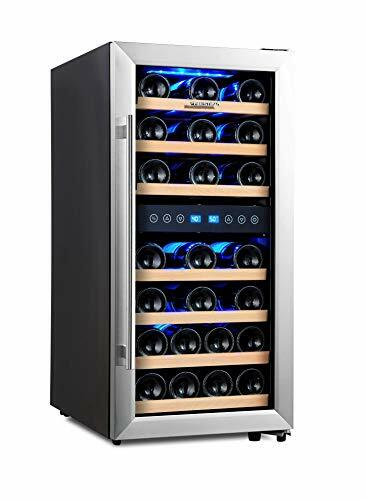 Wine taste better when they're perfectly chilled, but keeping both red and white wines in a single zone wine cooler is not a good idea. What would be your best option if you have both red and white wine in your collection? 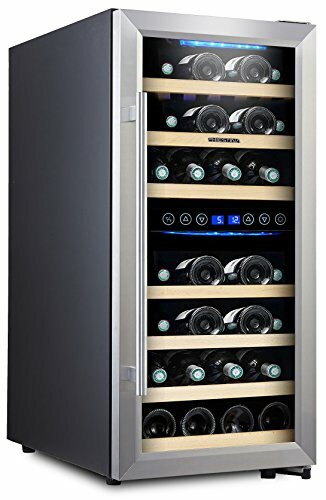 The Phiestina PH-CWR100 33-Bottle Dual Zone Wine Cooler Refrigerator is the answer! 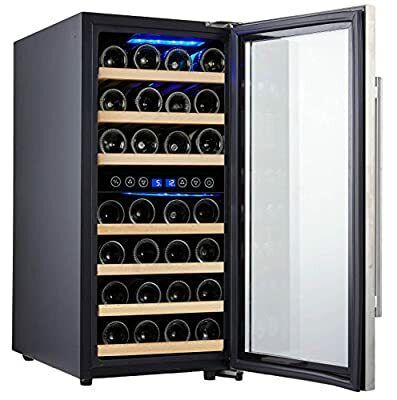 With the Phiestina PH-CWR100 33-Bottle Dual Zone Wine Cooler Refrigerator , you can keep up to 33 standard-Bordeaux bottles of red and white wine nic and frosty. Its freestanding design allows you to place it anywhere in your home. - ADJUSTABLE TEMPERATURE SETTINGS. 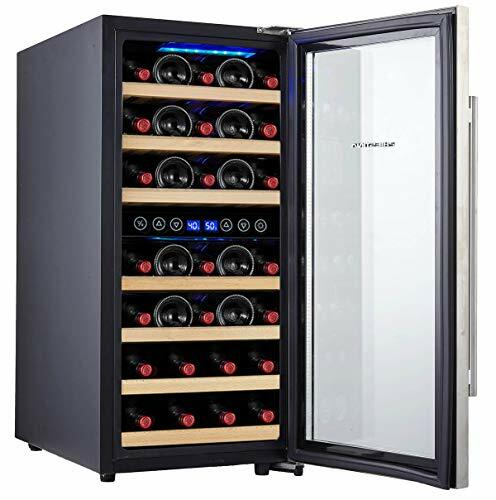 Whether you like your drinks slightly cool or downright frosty, this beverage fridge can meet your needs with a wide temperature range of 38 to 50 degrees Fahrenheit. - REMOVABLE SHELVES. The six black wire shelves can be removed as needed to make space for taller bottles and cans. - COMPRESSOR COOLING SYSTEM. Compressor cooling is more energy efficient than other cooling systems found in beverage coolers, and it's much quieter. - BLUE LED LIGHTING. Long-lasting, energy-efficient blue LED lights add style to the beverage refrigerator and help you find drinks. - DIGITAL CONTROLS. You can set the temperature in seconds and check it with a glance at the LCD screen. - COMPACT DESIGN. This beverage fridge requires only a small amount of space in a home, dorm or apartment. 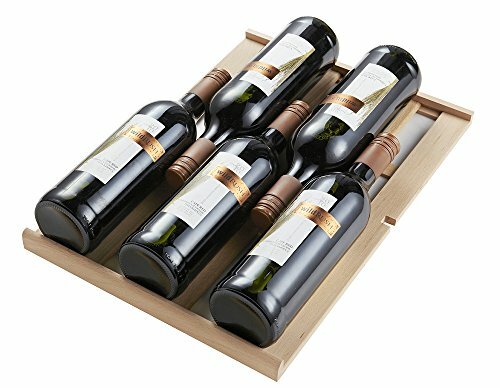 Store more wines at the perfect temperature for your fine collection. 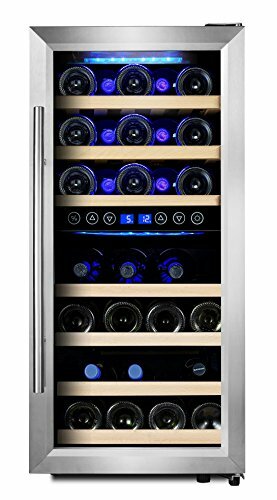 Order the Phiestina PH-CWR100 33-Bottle Dual Zone Wine Cooler Refrigerator now. This item is EnergyGuide approved.